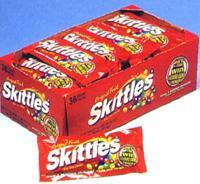 Skittles Original in the red pack. A true classic that started a whole new line in the candy category. Easy to snack on, sure to satisfy. Each box contains 36 bags of Skittles candy.